Rebecca Makkai’s third novel builds off of her bonafide skills from her previous two. 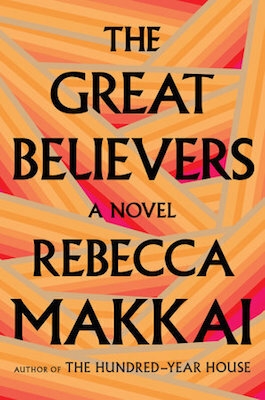 The Great Believers is about friendship, heartache, and redemption as the narrative alternates between the AIDS epidemic in 1985 Chicago and a modern day mother’s search for her estranged daughter who has fallen into a cult. These two plots are connected through friendship and highlights the lasting effects AIDS has on family and friends. The Chicago-based author does a tremendous job balancing the two narratives as she explores how people stand up against the struggles of disaster across time and location. She weaves together empathetic scenes to create a deeper understanding for two people who seemingly don’t have much in common. I corresponded with the author prior to the release of The Great Believers to chat about writing queer literature as a straight woman, research, and balancing narratives in her book. Read the interview below and be sure to check out how you can help raise money for Vital Bridges, a non-profit food pantry for those living with HIV/AIDS here. Adam Vitcavage: Queer literature has been gaining momentum in the mainstream lately. Garth Greenwell’s What Belongs to You and Joseph Cassara’s House of Impossible Beauties were two of my favorites of recent years. Those were written by two gay men. A Little Life by Hanya Yanagihara was also one of my favorites, which was obviously written by a straight woman. Did you feel pressure when conceiving this idea to represent LGBT culture accurately? Rebecca Makkai: Yes, of course. It would be wildly irresponsible to come into a project like this with any kind of hubris. I'm writing not only about a marginalized culture, but also about a very specific time of tragedy, things that happened to real people. The entire five years when I was writing this book, I was doing detailed research—both reading and in-person interviews—and towards the end, I had several people who I knew could be tough on me read the manuscript. I'm sure I've still made mistakes, but the book was made much stronger by the research I did. AV: With two main plotlines, I am curious how you thought about the initial idea that became this book. Were both plots always in your head or did the project evolve in some way to get to the finished version? RM: Actually, I started with neither Yale's nor Fiona's story, but with Nora—the woman who was an artist's model in 1920s Paris. It was going to be the story of this woman and the art guy (a collector, a gallery owner, I wasn't sure) who was acquiring the work she'd saved from that time. Slowly it became Yale's story, and then once I'd written about 150 pages of his world, I realized I needed to broaden things. Fiona was a minor character at that point, but I liked her a lot, and so gave her the 2015 sections, going back and weaving those in as I wrote them. I don't think it's ever possible to look at a finished book and guess where it started. And if it is possible, it's probably a sign that the author didn't have a lot of fun writing. I can't imagine getting an idea and then sitting down and faithfully executing that exact idea for the next few years. I'd die of boredom. AV: The story weaves in and out of the two main narratives as opposed to having two distinct sections. Why choose this structure? What does it do to the narrative? RM: I liked how it allowed me to play with time. We have the 1980s sections and the 2015 sections unfolding 30 years apart, which means we can meet the same characters at different ages, and we can see the echoes of history and loss and grief. AV: I am sure a great deal of in depth and careful research went into getting the details of the AIDS crisis correct. What were the most shocking details you learned while writing this book? RM: There's a section in the novel where a friend is telling Yale all the jobs he has to prove he can't do in order to qualify for disability... The jobs are so hilariously awful that they probably sound made up, but that's a real list. I was shocked at the cost of AZT when it was first introduced. Mostly, though, my emotional reaction to things I learned was not shock. I've been paying attention for a long time. In a lot of my interviews (with survivors, doctors, nurses, activists, lawyers, journalists, historians) I was more taken with people's stories of profound generosity and joy and humor. Even when the stories were devastating, they were full of so much humanity, and I tried to capture that in the novel. AV: When you were researching, did you mention to any people—especially men with HIV—that you were writing a book about this time period? What was their reaction? RM: Yes, my research process meant I couldn't keep this book a secret. I needed to be asking everyone I knew if they knew people who'd been in Boystown in the ‘80s, if they knew anyone who'd been HIV positive since the early ‘80s, etc. Friends and strangers who are HIV positive were equally supportive, and although I'd assume that people might question my ability or right to tell the story, no one did. They mostly just wanted to tell me stuff. I loved that; if I was speaking at a library, for instance, and someone asked about my next project, I'd often have several people running up afterwards to tell me things. Men who'd lost lovers, women who'd been nurses on AIDS units, people who'd lost friends. It's a privilege to be able to hear other people's stories—you really get sick of your own after a while—and I hope that publishing this book means I'll get to hear more of them. AV: I think—and I may be wrong—that a lot of people assume AIDS isn’t as much of an issue anymore. Maybe I live a sheltered life. (Maybe you can answer this based off of your research.) What do we need to know about AIDS in 2018? What work needs to be done? RM: Oof, well, we should probably start with the fact that over a million people died of AIDS last year. Last year. This was largely in Africa, which is why a lot of Americans aren't tuned in. (I don't believe it's just about the distance; if a million Europeans died of AIDS, we'd damn well be hearing about it.) But there are also over a million people living with HIV in the US right now, and around 6,000 dying from the disease each year. According to the CDC, in 2014, it was the eighth leading cause of death for Americans age 25 to 34. Late last year, Trump fired all the remaining members of the HIV/AIDS Advisory Council. A lot of the work that needs to be done is being done by the same overworked and underfunded people who've been doing it since the ‘80s: education, testing, assistance, support, activism. We need to keep supporting them; we can't forget about these people and their work. And we need to vote out of office any politicians who think they can ignore this problem, or think (maybe know) that their base will congratulate them for what amounts to murder by neglect. AV: There are obvious parallels to the government and healthcare’s reactions during the ‘80s and today. What can readers learn about these topics from your book? Additionally, what else should they explore (books, essays, films) to help better get a grasp on healthcare as it relates to AIDS? RM: There are always going to be people in power willing to murder marginalized groups. It doesn't always look like murder. It looks like a really, really expensive pill that doesn't need to be expensive. It looks like policies that keep people in poverty. It looks like a converted Walmart with cots for toddlers because those are the rules. My character Yale is a very careful, buttoned-up guy who, by the end of the book, is out there in the streets protesting, willing to get trampled by the cops because he's fighting for his life and the life of everyone he loves. I hope that's an inspiration to some readers. To understand where we're coming from on AIDS and where we stand now, two great places to start are David France's How to Survive a Plague (about the healthcare side of things) Cleve Jones's When We Rise: My Life in the Movement (more about activism). Both books are personal as well as political, and both are great, compendious reads. To learn more about Rebecca Makkai, visit her official website, like her Facebook page, and follow her on Twitter and Instagram.